This baby cocoon and hat are not very thick and will be perfect for Spring and Fall. I knitted for a baby who will be born in a Spring time, so I thought lighter yarn would be better. 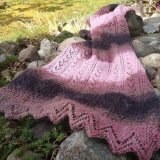 The yarn I used for this project is very soft and can be machine washed and dried. Any double knit (DK) baby yarn will work well for this. I used a little bigger needle than suggested by the yarns' labels. But I like the way it turned out. Gauge: 4.75-5 sts per inches. 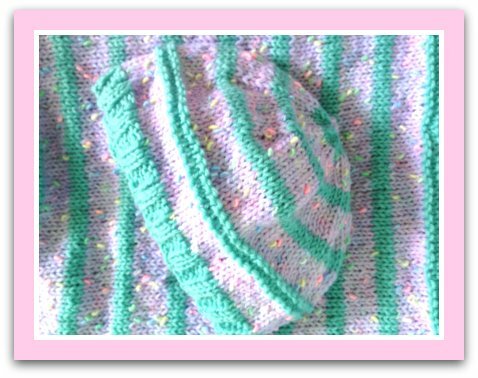 Image A: Striped Baby Cocoon With A Matching Hat to fit Newborns and infants up to 3-4 months. 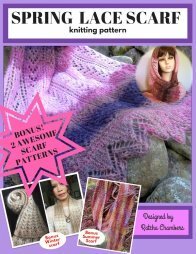 to download this pattern in PDF format without ads. 2. 1 ball (50 g/191 yds/175 m) of Sirdar Snuggly double knitting in light green (shade # 0419, lot # 116730) for contrasting color (or color B). With circular needles cast on 112 sts. using contrasting color B. Place marker. Join work in round and begin k2, p2 ribbing for 1 inch. Don't cut yarn. *Change to main color A and knit 6 rounds. (Tips: knit both colors together on the first stitch to prevent big gap. Don't forget to carry the non-working yarn along while working on the other yarn. Just wrap them around each other once every other round or so.) Change to color B and [knit 1 round, purl 1 round] twice. **Repeat from * to ** one more time. Rnd 1: *K 8, k2tog: rep from * to end of round. Rnd 2-4: Knit. Rnd 5: *K 7, k2tog; rep from * to end of round. Rnd 6-8: Knit. Rnd 9: *K 6, k2tog; rep from * to end of round. Rnd 10-12: Knit. Rnd 13: *K 5, k2tog; rep from * to end of round. Rnd 14-16: Knit. Rnd 17: *K 4, k2tog; rep from * to end of round. Rnd 18-20: Knit. Rnd 21: *K 3, k2tog; rep from * to end of round. Rnd 22-24: Knit. Rnd 25: *K 2, k2tog; rep from * to end of round. Knit 2 rows. Rnd 28: *K 1, k2tog; rep from *to end of round. Knit 1 row. Rnd 30: *K2tog: rep from * to the end. There should be 3 sts. Remained. Cut yarn leaving about 6 inches tail. Using tapestry needle, thread yarn through the 3 sts and weave the end of yarn on the wrong side of work. Secure and trim all loose ends. Block piece if needed. I didn't block mine because I was in a rush to get it out to the person. With double pointed needles and contrasting color B, cast on 80 sts. Divide them on to 3 needles. Joint round and place marker. Work K 2, P 2 rib for 1 inch. Change to main color A and knit for 6 rounds.Change to color B, *knit 1 row, p 1 row; repeat from * one more time. Change to color A, knit 6 rows. Change to color B and knit 3 rows. Begin decreasing rows as followed while keeping in striped pattern as for the cocoon. Rnd 1: *K 8, k2tog; rep from * to end of round. Rnd 2 and every alternate round: Knit. Rnd 3: *K 7, k2tog; rep from * to end of round. Rnd 5: *K 6, k2tog; rep from * to end of round. Continue decreasing in this manner until you have 3 sts. Left on the needles. Finishing off the same way as the cocoon. 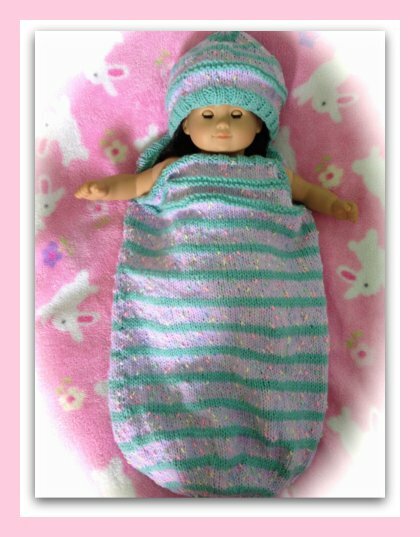 Share photo of your finished baby cocoon and hat with us at My Photo Gallery.